Owl is me and I am Owl. Owl is my trail name and was given to me in 2010 right before I left for my Appalachian Trail section hike. She is a lover of the outdoors and the primal state of the wilderness and her ultimate comfort and peace is found snuggled in a sleeping bag on a mountain somewhere. This passion for the outdoors began at the age of 14 years old when I summited my first mountain peak in the Northern Cascades during a Outward Bound Youth Leadership Course. It was in that moment, as I looked down at the valley WAYYYY below me, that I instantly knew where my spirit belonged as often as it could get there. That summit resulted in a total of 2 Outward Bound courses as a youth and a semester long Outward Bound course as an 18 year old spending 1 month in Baja, Mexico ocean kayaking from island to island, then rock climbing and desert backpacking in Joshua Tree, California and then finishing up Mountaineering in the High Sierra’s of California. For my 30th birthday, taking a risk and leaving my sweet family at home, I did a 200 mile solo trek on the Appalachian Trail from Northern Pennsylvania to mid Virginia. For the year of my 40th birthday, I completed the Lone Star Hiking trail in East Texas…the longest continuous hiking trail in the state at 100 miles in 5 days as a training hike for the upcoming solo thru hike of the John Muir Trail. Then that summer in 2016, I completed the John Muir Trail in the epic Sierra Mountains finishing at 262 miles, beginning in Yosemite National Park and ending at the top of Mt. Whitney, 14,505ft. (Then had to hike down to the Whitney portal of course). Last year, my son, Hi-Five and I, completed a 6 day trek on the Appalachian Trail exploring Tennessee together on his 13th birthday which was absolutely incredible. What’s next? Colorado Trail? Wonderland Trail in Washington state? Who knows! Isn’t that great???!! Adventure, unexpected journeys and getting your family and children out of their comfort zone as much as can be tolerated is my goal. Also to really focus on embracing the journey and that includes the good, the bad and the ugly. 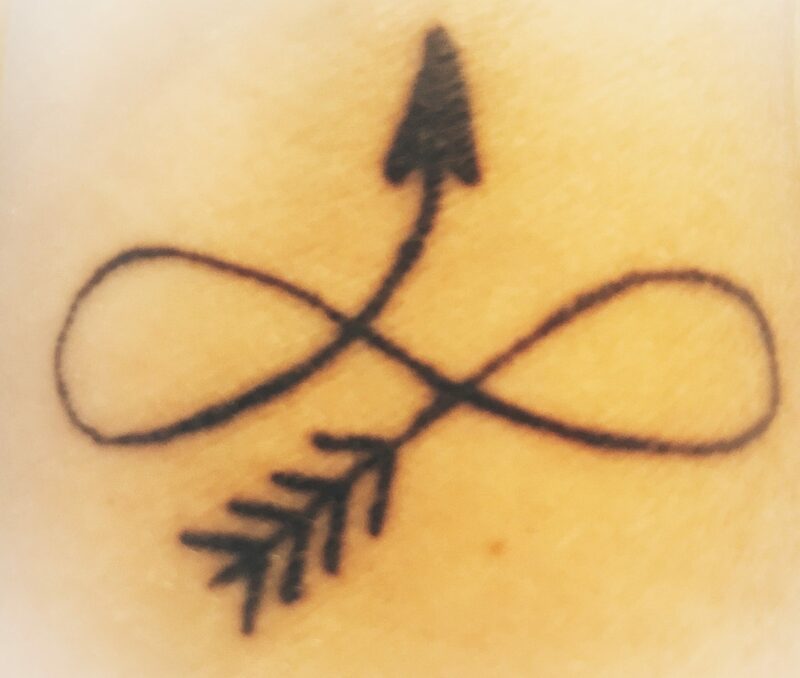 My tattoo above is what I designed to represent that exact mindset…the arrow is pointed towards my fingers on my wrist to remind me and those around me to embrace every situation as a possibility and not an obstacle. Sierra, my amazing adventure mobile, has driven all over the country and my boys have seen more mountains, camped more nights and hiked more miles than some people are blessed enough to see in a lifetime. I don’t know if they really understand how lucky they are to have been exposed to so much so young. Yet…there are still adventures to be had, roads untraveled and fascinating people still yet to meet. I have been married to the love of my life for over 22 years and have two INCREDIBLE sons that are my adventure buddies! We love to camp, hike, backpack, road trip, travel, meet new people, visit new places and take our time while doing it. We homeschool and so we often take our studies on the road so that we can see even more of this amazingly beautiful country of ours. Life is too short to be stuck between 4 walls watching on the National Geographic channel the cool places to visit. My humble goal as a mother and wife is for our family to not just read about those places but to step foot at those places and breathe the same air those places exist. Many more to go on our journey, but we are off to a great start! Check out my blog for adventures in homeschooling, road tripping failures and successes, hiking journeys and lessons learned along the way and much more! Oh..and don’t forget to follow Owl if you are interested! Come adventure with me!